When I woke up this morning at O’Dark Thirty (4:30am) I peeked outside to check out the sky. The clouds that moved in two days ago had some breaks and pockets with a few stars poking through here and there so, I thought it might be worth getting dressed and going out for the sunrise. It’s been sometime since I have shot a sunrise by the water so I headed to one of my “go to” spots; Vasona Lake which isn’t too far from me. While walking over to my shooting location on the lake I could hear that the geese were already up making a fuss about something, and soon they had the mallards, and coots up, and it wasn’t too long afterwords that I spied the first morning runners and walkers out for their morning’s exercise. Then the sun started making its way up and over the mountains bringing with it some wonderful yellow and pink hues. All and all a wonderful sunrise! This is such a beautiful photograph. I love reflections, especially those in water. Thank you so much Dan! I too love reflection in water best. A beautiful photo – nice colours – almost has a ‘old world’ focus to it. Well worth the early rise I would have thought. 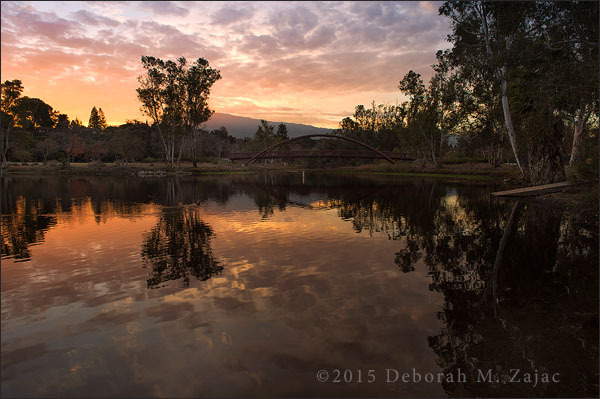 This is a beautifully composed photo, Deborah! I love it… I feel sorta guilty, because I try to avoid getting up at dark o’clock! Thank you so much Melissa. I’ll float on this compliment for days! re: getting up early. I can relate. For most of my life I wasn’t a morning person and could and would sleep til noon whenever possible. It’s just been the last 20yrs or so I’ve become a morning person. The amount of sleep I need has changed as I’ve gotten older.